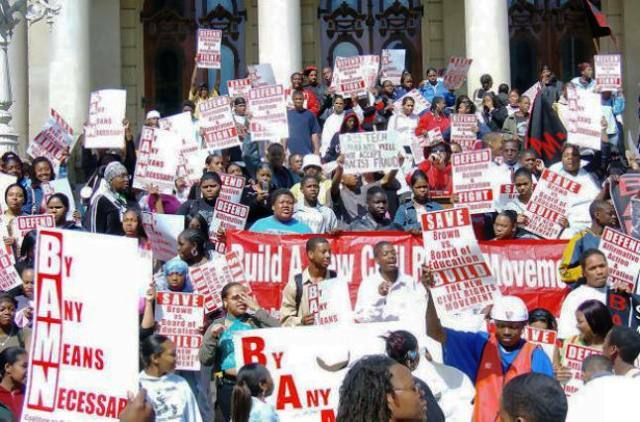 BAMN protest against anti-affirmative action Proposal 2 in Lansing before its passage. BAMN today supported Michigan Attorney General Bill Schuette’s request that the Supreme Court review the decision of the Sixth Circuit striking down Proposal 2, Michigan’s anti-affirmative action proposal. In a brief filed with the Supreme Court today, BAMN asked the Court to grant review in order to strike down California’s Proposition 209 and the identical laws that have been passed in Arizona, Nebraska, Oklahoma and Washington. 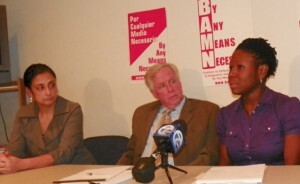 Attorneys Shanta Driver, George Washington, and Monica Smith announce victory Nov. 15, 2012 after Sixth Circuit Court overturned Proposal 2. Since then, at the request of Michigan AG Bill Schuette, the decision has been stayed pending a hearing at the U.S. Supreme Court. The anti-affirmative action amendment passed in Michigan November 2006. The entire Sixth Circuit held that it was unconstitutional on November 15, 2012. Michigan’s Attorney General has asked the Supreme Court to review the case. The exact same proposal had passed in California in November 2006 and was upheld by the Ninth Circuit in 1997. I respect your comments always . Yet on this matter I agree and disagree with some of them. One does not have be a woman, gay, Black or White to support equality and justice. Yes you are not Black Man nor am I White Woman yet we both share the same passion for certain issues. I am not upset with your disagreement with my views nor nor do I think your views which are at odds with mine about BAMN is hurtful to me nor should you reconsider your words to me in your initial comments. My views about BAMN are mine based upon my interactions with BAMN years ago as I noted my activism and efforts have long existed and predated any of BAMN ‘s. I remain true to the struggle and more importance to me true to YOU. has been the legacy of many relationships between white and Black liberation efforts. I have been a Black man and a Black activist since the day I entered this world . I have always been an advocate of Justice and Affirmative Action. Long before BAMN existed I have been a Black Man in the struggle. I do not seek nor need any one’s validation nor approval on anything . I alone reserve the right to be me. BAMN nor any other group speaks for me or on my behalf nothing I have done in my life as a Black man or a Black activist requires of me to retreat, surrender or offer up any apology. My body of work and my life as a Black man in America speaks to my personhood and concern for humanity and equality in the world. Clearly Monica Williams is a Black woman but she was not a founding member of BAMN and as to her current title and role in BAMN that remains a mystery. With regard to Shanta Driver she is not a Black woman . I also respect the legacy and service of George Washington on a number of fronts and issues. Diane you know that I respect and admire you and your legacy. I am disappointed with your opinion about my views about BAMN . I hope that will pass but we are both independent thinkers and as such sometimes we will just disagree on issues. I will continue to support Affirmative Action and related efforts if they make sense from my vantahe point. I will never be a hollow cheerleader. I support all legislation that supports Affirmative Action. I do not support AG Schuette nor BAMN a group of white liberals who often exploit Black people as advocates for the objectives of BAMN which are often not the objectives of the people. BAMN has never had Black leadership at the top of it’s organization it is revealing how they are now partnering with Schuette who is supports the disenfranchisement of DPS and the ER laws. Something is out of order here!!!! Greg, I believe you misunderstand what is said in BAMN’s release. They are not “partnering” with Schuette. Read the article linked at the bottom, which I wrote after the Sixth Circuit struck down Prop 2 as a result of the constant work of BAMN, its attorneys, and its organizers. The majority of the group and its leaders are people of color; two of the attorneys in the photo, Shanta Driver and Monica Smith, are Black and in the top leadership of BAMN. (By the way, I have reported on the activities of BAMN for at least 13 years, and I hardly believe they would term themselves “liberal,” they are certainly to the left of that.) 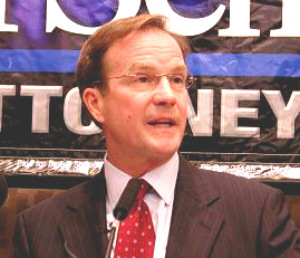 In the linked article, Schuette makes clear that he planned to appeal the Sixth Circuit decision to the U.S. Supreme Court; he successfully appealed for a stay pending the Supreme Court ruling. BAMN attorneys said at the time that they welcomed an appeal to the USSC, which in 2003 ruled in favor of U of M’s affirmative action plans. The Prop 2 campaign was a direct counter to this USSC ruling, seeking to whip up racism among Michigan’s voters and deliberately misrepresenting itself as a campaign FOR affirmative action. BAMN’s attorneys said at that time they would welcome a chance to argue the case before the USSC because it would enable them to bring in cases across the U.S. and have the USSC strike down similar Prop 2 actions there. I have known George Washington since the 1980’s, when I was a union leader for AFSCME Local 457, city of Detroit workers. He fought tirelessly against attacks on Detroit’s majority Black city workers, and he is still the attorney used by Locals 207 (Water) and 312 (D-DOT mechanics). I respected his work then and respect it now. I would ask that you reconsider your comments, which I believe are hurtful to the battle for affirmative action.